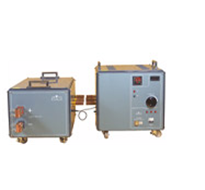 The LET-4000-R is designed to perform high current DC injection test, used mainly in the railway industry to test extra fast relays used in the electric motors of the locomotive. The unit is supplied in 2 modules: the Regulation and Measurement Module and a AC/DC converter. Regulation and Measurement Module performs the regulation of the DC current and is made with a variable auto transformer (Variac) regulating a three phase DC current, with a power of 8KVA and a three phase transformer of 8KVA with 2V nominal power in the secondary windings. A built-in ammeter and a timer give the information of the current injected and the operation time of the relay under test. AC/DC Converter Module rectifies the Alternating Current to work with the above mention unit. The signal is rectified in a complete sine wave. The output are in 2 taps adequately dimensioned. This unit also contains the measurement shunts, which gives the measurement value to the ammeter located in the other module. - For testing extra fast relays in DC current, mainly used in the railway industry. - In general the use of any high DC current applications. - DC Current output to 5000A, 8000W. - Built in digital ammeter, 0.5% accuracy. - Built in digital timer resolution 1 ms.
- Thermal and shortcircuit protection.